The Aussies have done it again. 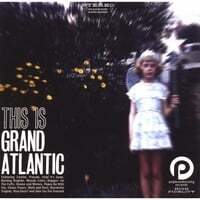 Much in the way that you knew something on the Not Lame label was going to be great (and in the same way you currently know about Kool Kat releases), the Popboomerang logo on the cover of a disc has become a imprimatur of power pop quality, and This Is Grand Atlantic, the debut disc of Brisbane-based Grand Atlantic is another winner from Down Under. Their style is closest to the Brit-pop of Oasis, with Sloan and Cheap Trick also prominent in their sound. Grand Atlantic wastes no time in getting down to business here: "Coolite" is all swagger and power pop at its best; the track rocks along with crunchy guitars and handclaps, and lead singer Phil Usher has the classic pop/rock voice. "Smoke and Mirrors", with its "under the radar" refrain that will burrow into your head, is more of the same, while "Chaos Theory" sounds like a Noel Gallagher rewrite of "Rain", which is a good thing. "Wonderful Tragedy" lets them branch out, with strings and horns in the service of a great ballad, and "Nice Guys?" sounds like Teenage Fanclub in one of their more rocking moments. The horns are out again on the 60s-influenced "Burning Brighter", which reminds me of the recent Mellowmen disc, and don't overlook the closer, "Peace Be With You", which sounds like Brian Wilson's attempt at "A Day In The Life". All in all, it's outstanding and inspired work from these Aussies, and a definite top 20 (if not top 10) contender for 2007.
thanks for for the reccomendation.. As usual you are right on. More good stuff on eMusic.